The Apostolic Palace (Latin: Palatium Apostolicum; Italian: Palazzo Apostolico) is the official residence of the Pope, which is located in Vatican City. 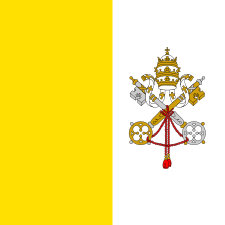 It is also known as the Papal Palace, Palace of the Vatican and Vatican Palace. 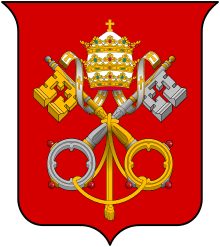 The Vatican itself refers to the building as the Palace of Sixtus V in honor of Pope Sixtus V.
The building contains the Papal Apartments, various offices of the Catholic Church and the Holy See, private and public chapels, Vatican Museums, and the Vatican Library, including the Sistine Chapel, Raphael Rooms, and Borgia Apartment. The modern tourist can see these last and other parts of the palace, but other parts, such as the Sala Regia and Cappella Paolina, are closed to tourists. The Scala Regia can be seen into from one end but not entered. Construction of the Papal Palace (also known as the Apostolic Palace or Vatican Palace) at the Vatican in Vatican City, took place mainly between 1471 and 1605. Covering 162,000m squared (1,743,753ft squared), it contains the Papal Apartments, offices of the Roman Catholic Church and Holy See, chapels, Vatican Library, museums and art galleries. One of the primary functions of the chapel is as a venue for the election of each successive Pope in a conclave of the College of Cardinals. 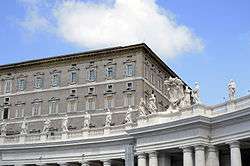 In this closed-door election, the cardinals choose a successor to the first pope, St. Peter, who has traditionally set up residence within the Apostolic Palace. Running from east to west, as a visitor would have entered the apartment, but reversing the sequence in which the Stanze were frescoed, and also the route of the modern visitor, the rooms are the Sala di Costantino ("Hall of Constantine"), the Stanza di Eliodoro ("Room of Heliodorus"), the Stanza della Segnatura (the earliest and the most admired) ("Room of the Signatura") and the Stanza dell'Incendio del Borgo ("The Room of the Fire in the Borgo"). The Borgia Apartments are a suite of rooms in the Palace adapted for personal use by Pope Alexander VI (Rodrígo de Borgia). He commissioned the Italian painter Pinturicchio to lavishly decorate the apartments with frescoes. 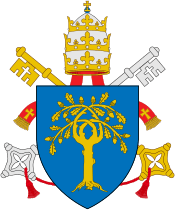 ↑ Vatican Press Office guide – buildings of the Vatican Archived May 29, 2010, at the Wayback Machine. ↑ "Le Palais du Vatican" [Palace of the Vatican] (in French). Rome Découverte. Retrieved 14 August 2013. ↑ Müntz, Eugène (1878). Les arts à la cour des Papes pendant le XVe et le XVIe siècle (in French). Georg Olms Verlag. ISBN 9783487413006. Retrieved 14 August 2013. ↑ Levillain 2002, p. 1093-1094. ↑ Glenday, Craig (2013). Guiness Book of World Records. p. 155. ISBN 978-1-908843-15-9. ↑ Krén, Emil; Marx, Daniel. "Frescoes in the Borgia Apartments of the Palazzi Pontifici in Vatican". Web Gallery of Art. Retrieved 14 August 2013.